"This is a great and easy one pot dish that you can guarantee everyone will love!" In same pot, saute onion and bell pepper over medium heat until softened. Remove from pan. In same pot, cook sausage over medium heat until brown. Drain. Combine onion mixture, pasta, sausage, mushrooms and stewed tomatoes in same pot and heat through, 5 minutes. Serve. This was terrific! Easy to make, good flavor blend, and the whole family enjoyed it. Thought it was great. I started off by adding extra spices like basil, oregano, cilantro, as well as tomato paste and fresh garlic. This was okay, but kind of bland. If I consider making this again, I will add some spices and garlic. 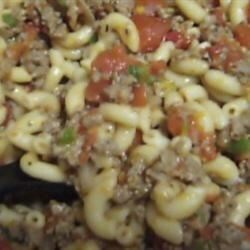 This is similar to a New England standard (I'm from Boston) that we call American Chop Suey. Our version uses hamburger, and the green pepper is mandatory. So bland as written. I had to add a lot of spices and served it with shredded cheese and sour cream. I only used 1 cup of macaroni which is perfect for our family and left out the mushrooms for personal preference. This was enjoyed by all.